Hello, Halloween fans. Tonight we explore the spookiest number to ever grace a baseball card. The No. 666, the so-called "Mark of the Beast," is often associated with the devil. And for years, it was too scary of a number to appear on the back of a baseball card unless some player was unfortunate enough to compile exactly 666 career hits, runs, RBIs, etc. We're all aware of the Upper Deck employee who as a Giants fan thought it would be amusing to make sure that a Dodger player received card #666. And for a few years in the early days of Upper Deck's history, that's exactly what happened. 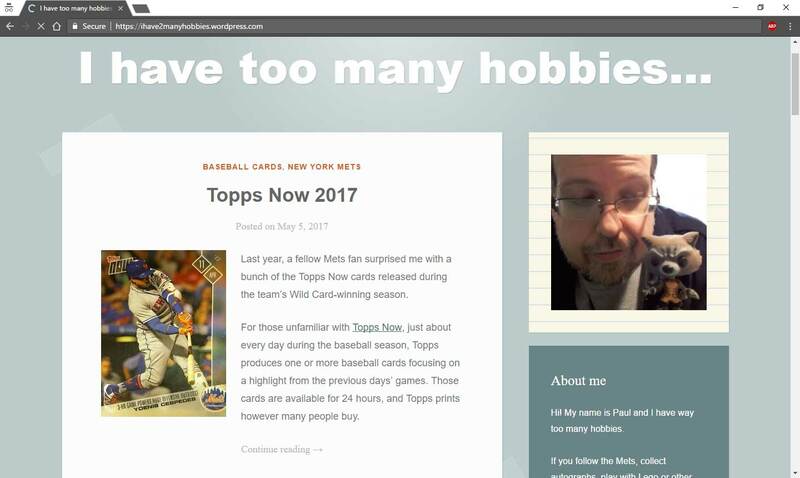 Of course, Upper Deck eventually lost its MLB license and fell out of favor with a lot of collectors, and I'll bet that it can be traced to this particular prank. You don't fool with No. 666. 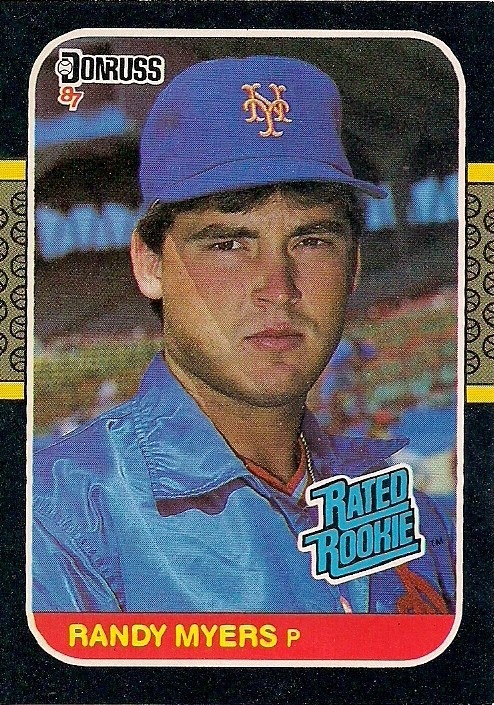 In fact, Topps knew better for a number of years. 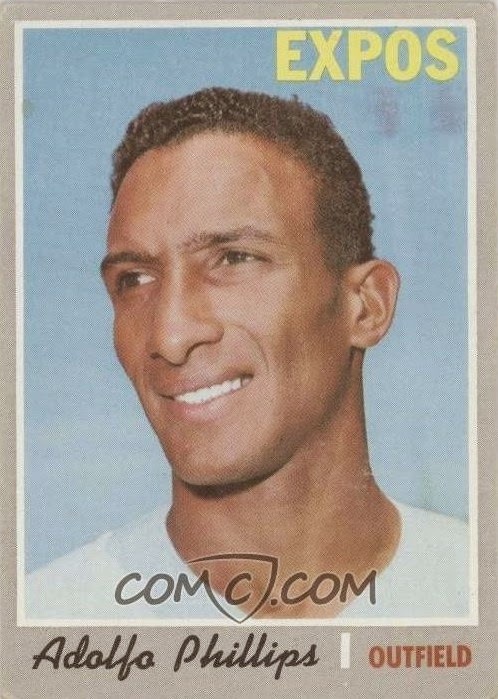 Card sets rarely came close to having 600 cards in a set, let alone 700, so which player would be featured on card #666 was never a question. 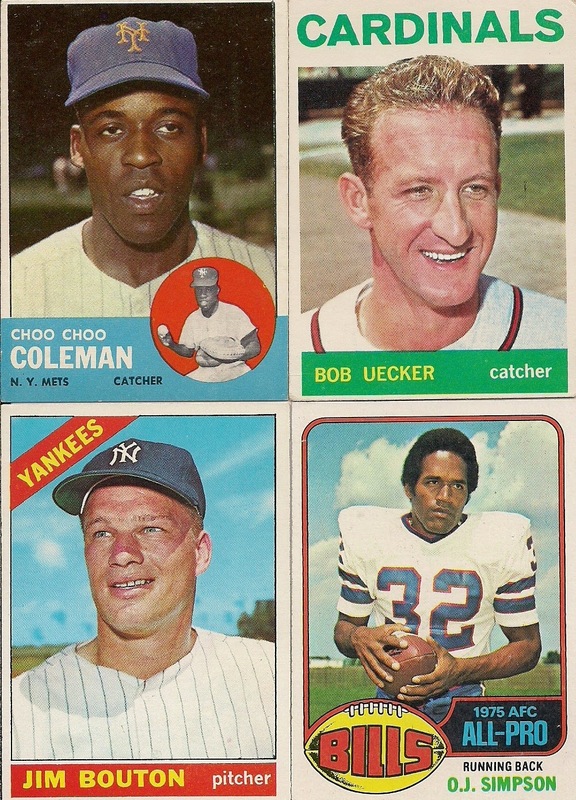 In 1969, Topps issued a set of 664 cards and you can't tell me that it didn't stop there because a 666-card set was just too creepy. It's rather apparent: "Well, we could have just 665 cards. ... No, let's have 664 cards and then it doesn't look like we were freaked out by 666 in a set." 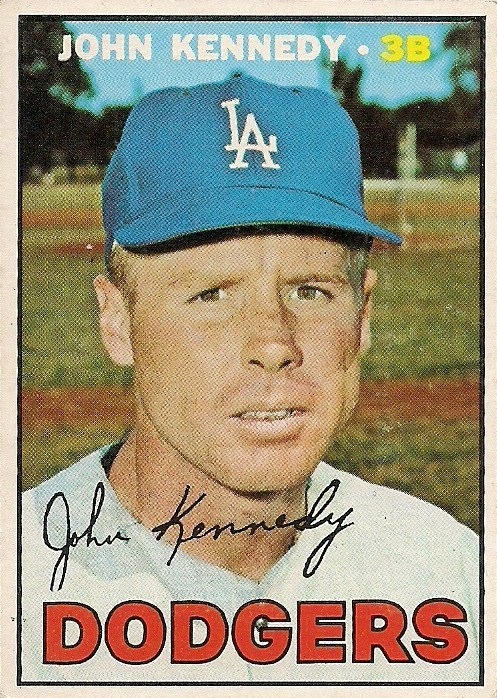 But in 1970, Topps found its gonads and issued a set of 720 cards. That means someone would have to be card No. 666. That someone was Adolfo Phillips. A former Cub who was unlucky enough to be traded to the expansion Expos in 1969 (although considering what happened to the '69 Cubs, maybe he was fortunate). 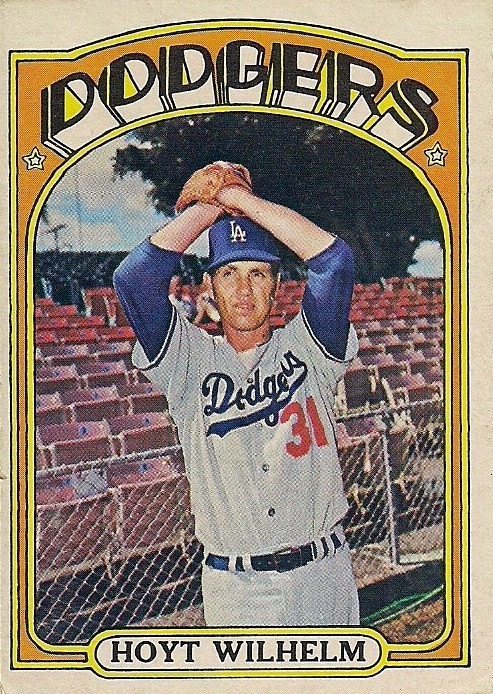 Phillips made it through being number #666 relatively unscathed, but it's interesting to note that he spent the entire 1971 season in the minor leagues after seven years in the majors. Hmmm. 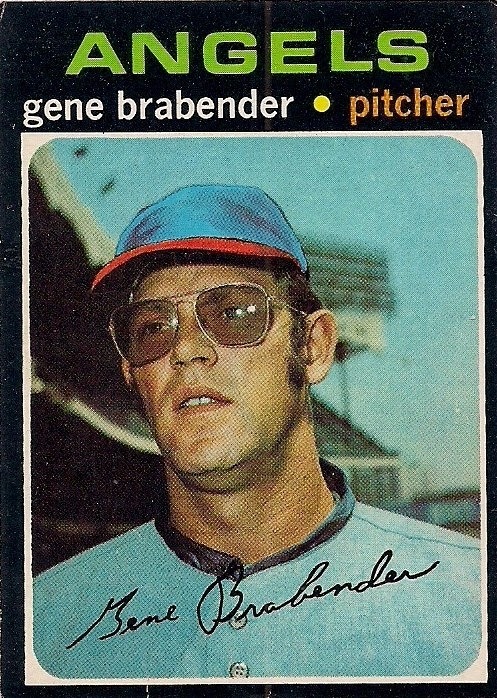 Card #666 in the 1971 set was Gene Brabender. 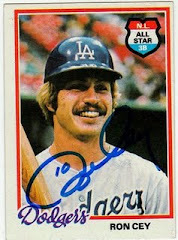 Brabender was also recently transacted, traded from the Brewers to the Angels in 1971. 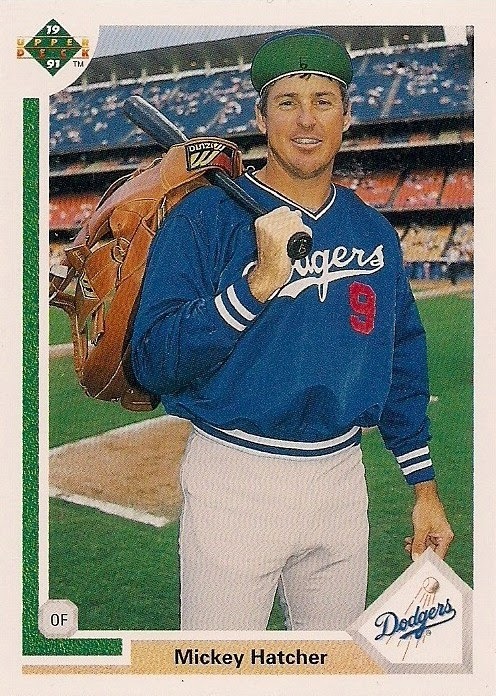 Brabender would not play another major league game after receiving card #666. And his nickname was "Lurch". Hmmmm. 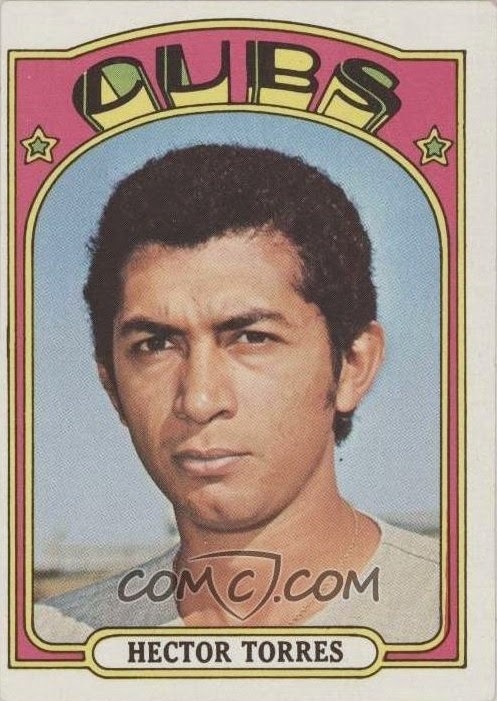 Hector Torres, a backup infielder during the 1970s, received #666 in the 1972 set. He doesn't seem too happy about it. Torres would play until 1977, but always with lousy teams, the Expos, the Padres, the expansion Blue Jays. Hmmmm. 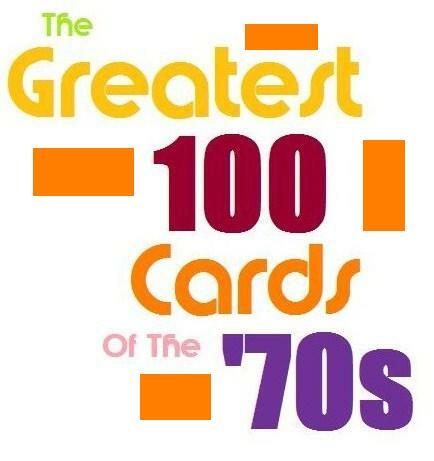 Then in 1973, Topps scaled back its set, to 660 cards. There would be no #666. 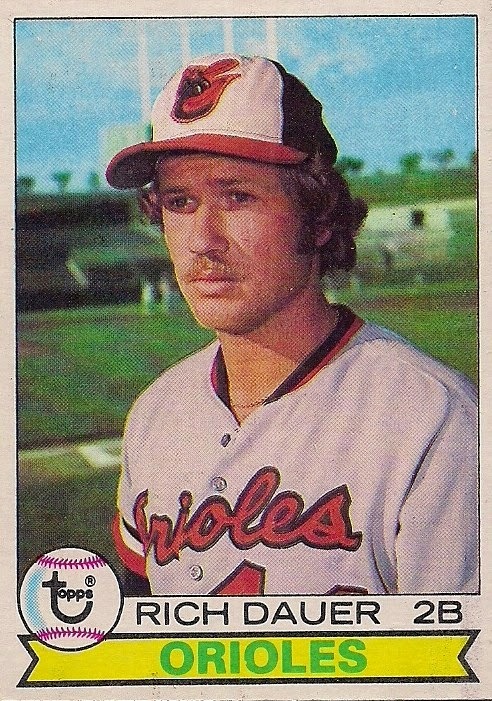 Maybe Topps got freaked out by "The Exorcist," which was released around then (although in December 1973). 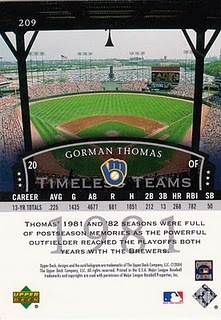 But whatever the reason, Topps stuck with 660 cards for the next five years. These are the sets that I knew when I first started collecting. A 660-card made sense to me. 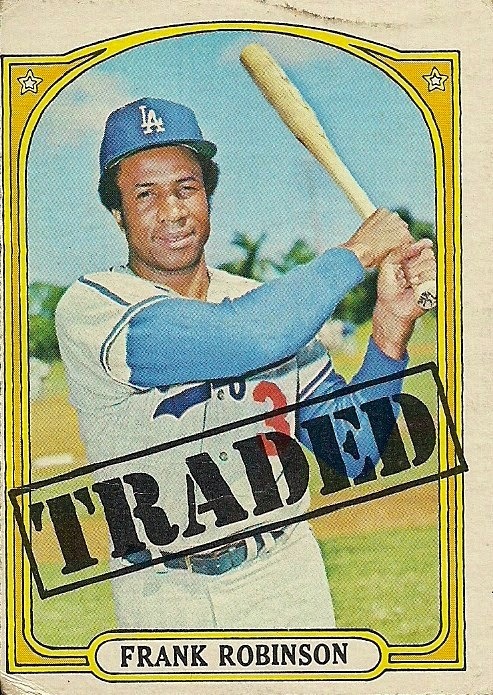 But, in 1978, Topps expanded again, with a 726-card set. I knew instantly: someone would be card #666. It was Billy Smith. 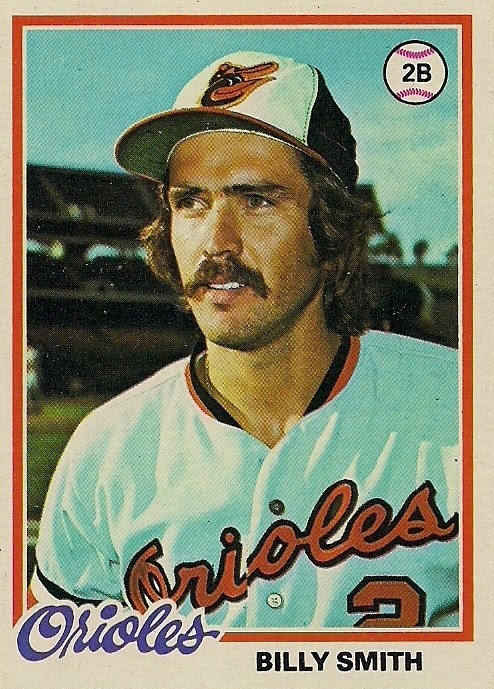 A weak-hitting infielder for the Orioles. I could tell he was sinister just looking at him. It all made sense to me. The .215 batting average. The 367 at-bats despite his .215 batting average. The fact that the Orioles still won with this person batting 367 times. I kept my eye on that Billy Smith card. 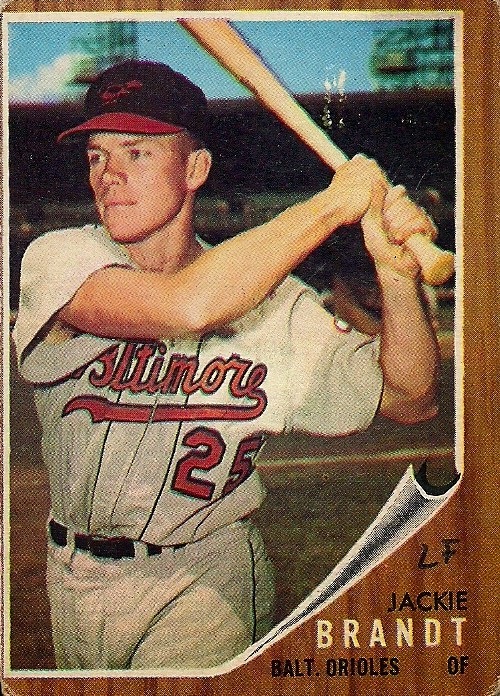 A year later, Topps' set was still 726 cards and I warily waited for the man who would wear #666. Another mediocre-hitting, middle infielder from the Orioles. 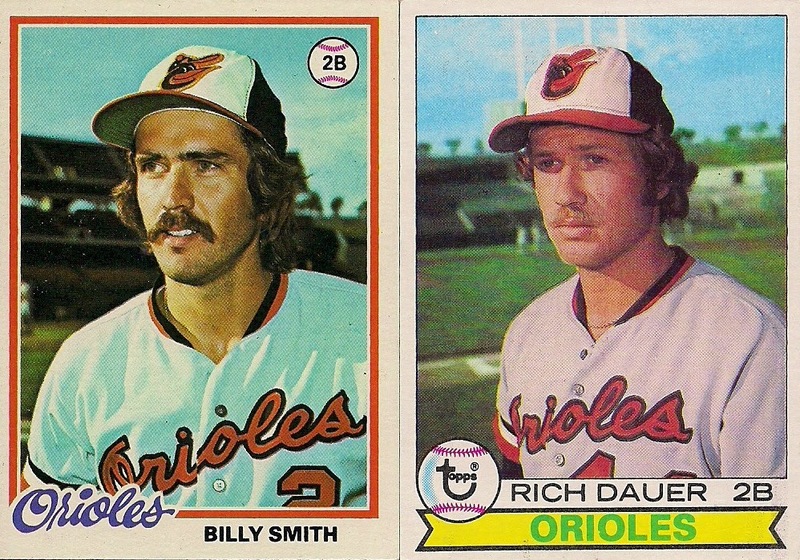 Sure, Dauer could hit better than Smith, but the similarity of the two cards gave me the willies. It's like looking at those twins in the hallway in "The Shining"
No, I'm not playing with either of you! 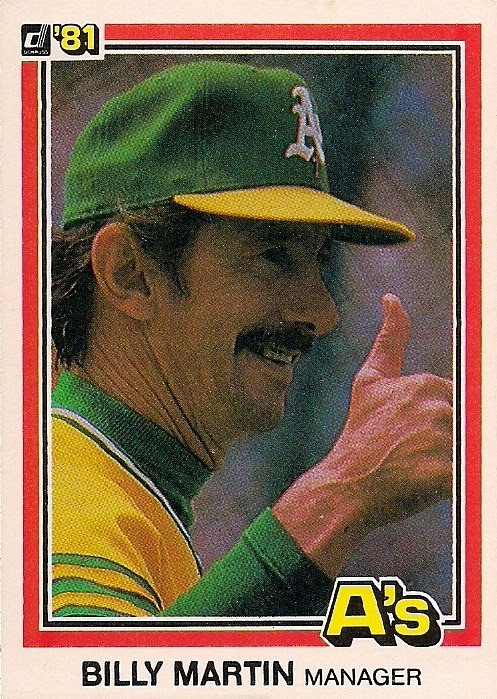 In 1980, Topps again issued a set of 726 cards, but they went in a different direction with card #666. 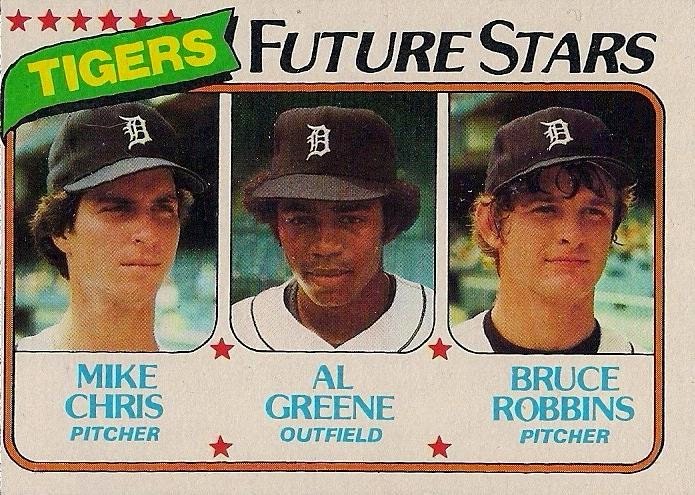 Card #666 was a bunch of Tigers future stars. That's a heck of a curse to place on some fresh-faced ball players. None of these players ended up being future stars, or even played all that long in the majors. I'm blaming #666. 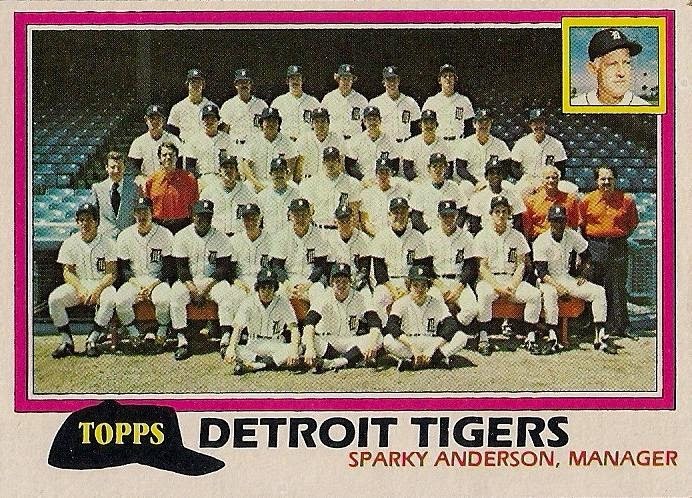 In 1981, card #666 was the entire Tigers team. 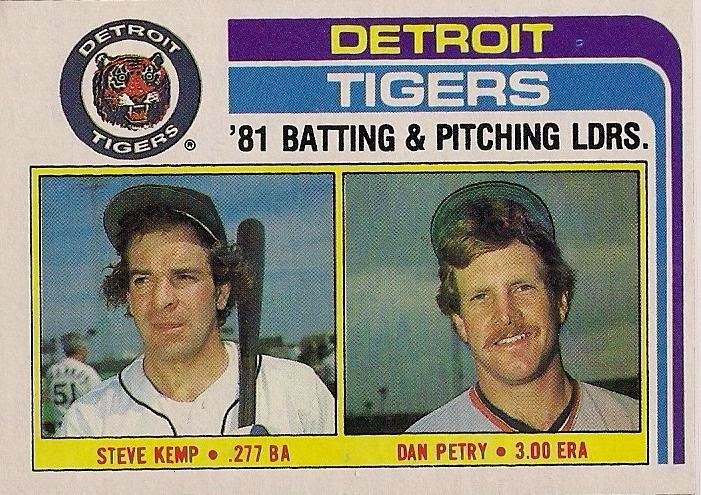 In 1982, it was the Tigers leaders, with their hats placed atop their head as if to ward off demons. 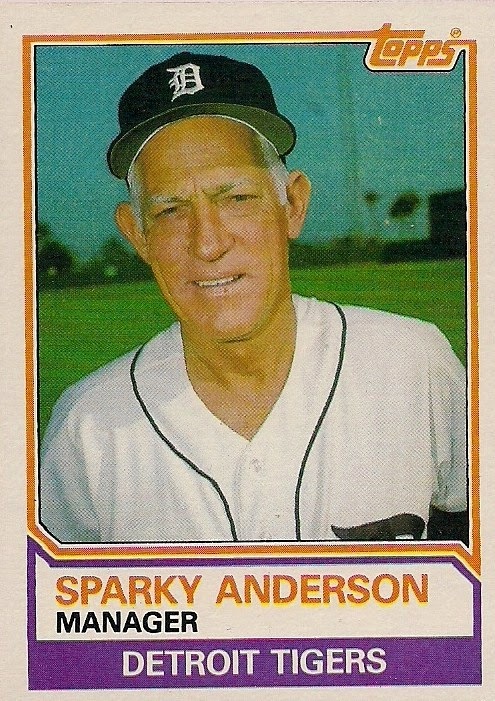 In 1983, it was the Tigers manager himself! 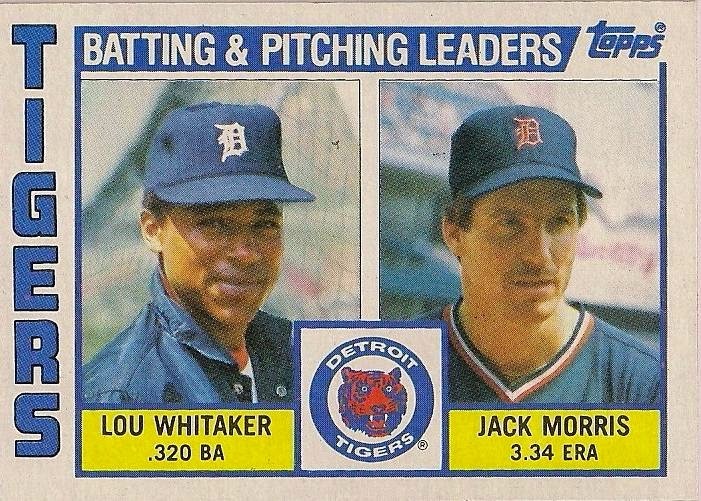 And in 1984, it was the Tigers' leaders again. (The Tiger logo looks particularly devilish here). In 1984, as you know, the Tigers won the World Series. It was practically decided in April. 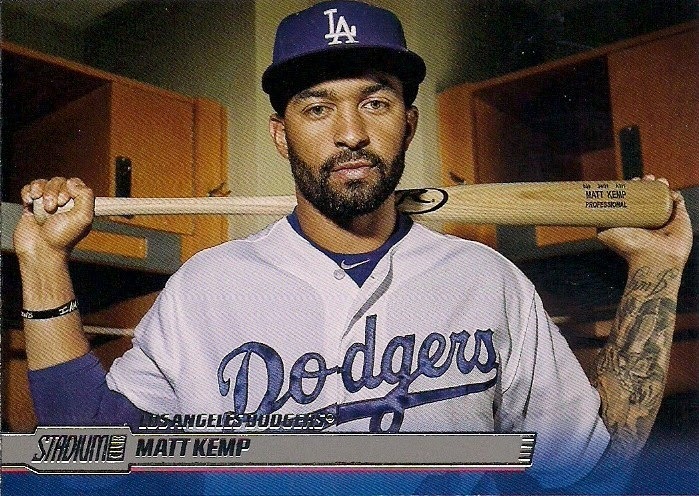 Then it dawned on me: did the Tigers make a pact with the devil and Topps? Did the Tigers agree to be featured as the #666 card all those years in exchange for a World Series title? I could only wait for the 1985 set to come out to find out. A pact with the devil I'm telling ya! The Tigers got their World Series so now they didn't need to be on card #666 anymore! After that, there didn't seem to be any pattern to who received the #666 card. 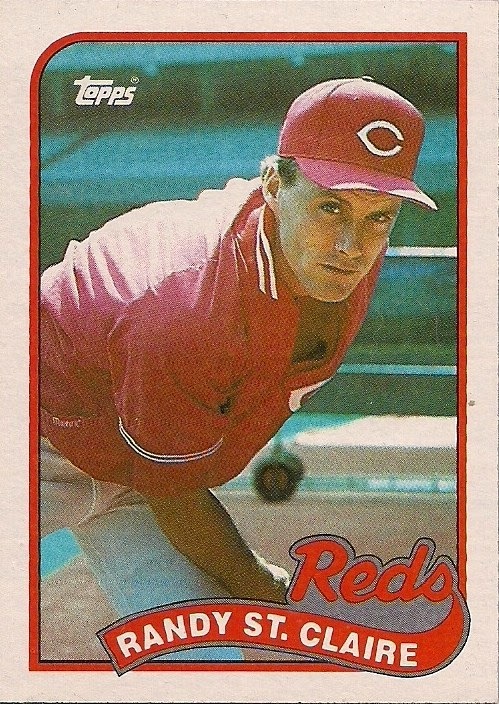 Card #666 in 1989 was also a Red. And the Reds won the World Series in 1990! If the 1990 #666 card is a Red, I'm calling in a priest to do an exorcism on my entire collection. So maybe all of this #666 card nonsense is just a coincidence. Except for those early Upper Deck #666 cards. That was just someone being creepy. Perhaps you've heard that 1.8 percent of major league baseball fans are happy because the Giants won the World Series again. As you can imagine, I'm part of the 98.2 percent that is not happy. In the least. I can't bring myself to say it was a great postseason or Series or any of that 'yay, baseball!' stuff because I'm too INVESTED. Also, I'll never get used to the fact that a team that ended the season six games behind gets a World Series trophy. That's regardless of whether it's the Giants or not ... OK, it annoys me more that it's the Giants ... but, really, baseball what are you doing to yourself? I know it's irreparable and most fans have moved on and the other sports have been dealing with this for a long time since way back when I was a child, but six games behind, man. Six. Games. Behind. Anyway, it's another lost postseason and to add to that joy I've worked 15 days straight and there's no real certainty about my next day off. October has not been friendly other than the pretty colors outside, so it's time to immerse myself in something that is friendly. I recently received a glorious package from Dave, who has sent me so many goodies that I really need to be linking him. He doesn't have a blog, so I think I'll just throw his name down in the labels as a proper tribute. As usual, Dave covered just about all the bases when sending me a package, forcing me into a top 10 countdown (sorry, Lost Collector) of the most fantastic items. They're pretty cool. 10. 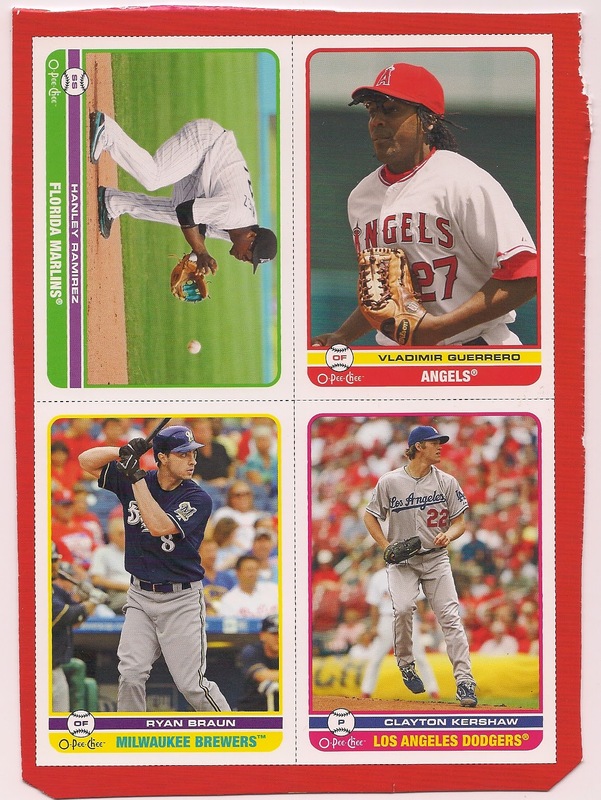 2009 O-Pee-Chee box bottom with KERSHAW! Dave has sent one of these before, and it's still intact. But I think I'll be cutting this up so I can add the Kershaw blank back in my collection. He can't be hanging out next to Ryan Braun anyway. Wow, there were a lot of these. That's not all of them either. Upper Deck trolling the Marlins. I'm not ranking these higher because they're mostly modern guys and I don't want to think about modern baseball right now. These did give me my first look at Stadium Club, and I like them a lot. 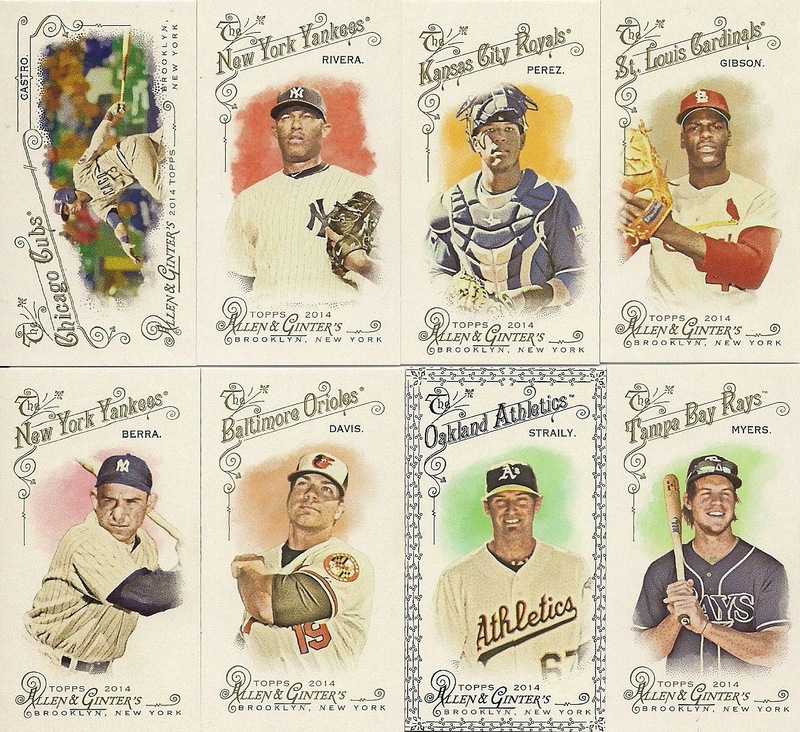 I'll never collect the full set because I learned from 2008 Stadium Club that Topps can't leave SC alone with out screwing up the collation or other nonsense. But the cards themselves look terrific. That's better. Here are some Dodgers who were able to win their division and ... here's a thought, then play in the World Series! They won some, too. That Dave is always thinking ... and coming up with cards. I like the One-and-Done Series that I do where I find players who had just one card in a major set for their whole career. But I've never made a collection out of it. Thanks to Dave, I now have a collection. A nice vintage collection, too! I'd love to rank these higher, but, you know, they were all Braves. One's from my hometown though (Logan), so I'll be nice to that one. The majority of these have already qualified for the frankenset binder. Some very, very nice ones there. I was so excited to get these that they were the first items I crossed off the want list. This group is abundant with Pirates ... and Rusty Kuntz. 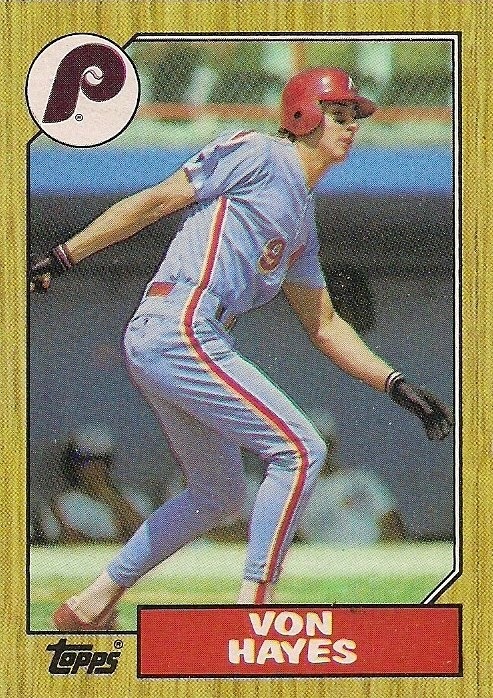 I'm starting to get a new appreciation for '81 Donruss with this project. I love the Sanguillen card. Is that a wife-beater he's wearing? Lots and lots of night cards, too. Many of them looked like above. I've never been happier to receive Yankees cards. 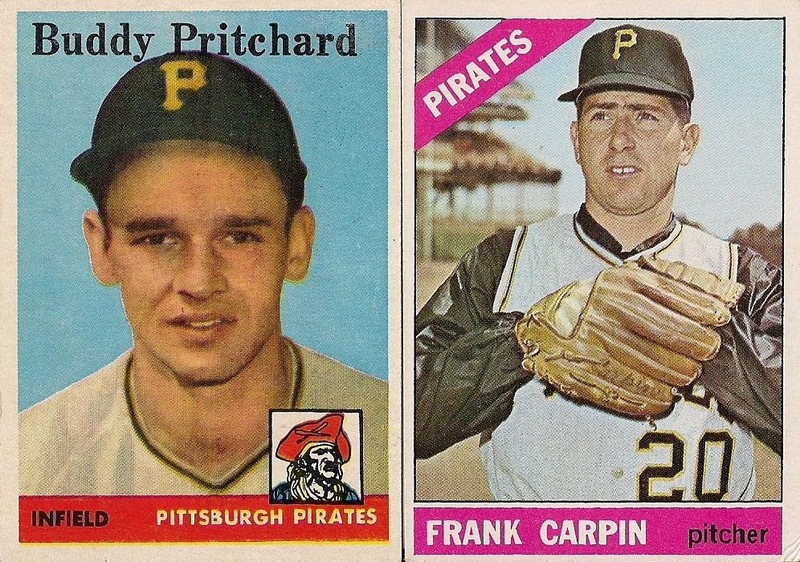 I also never knew that there were so many night cards in early 1960s Post sets. I have several of them now! I've always wanted this card. 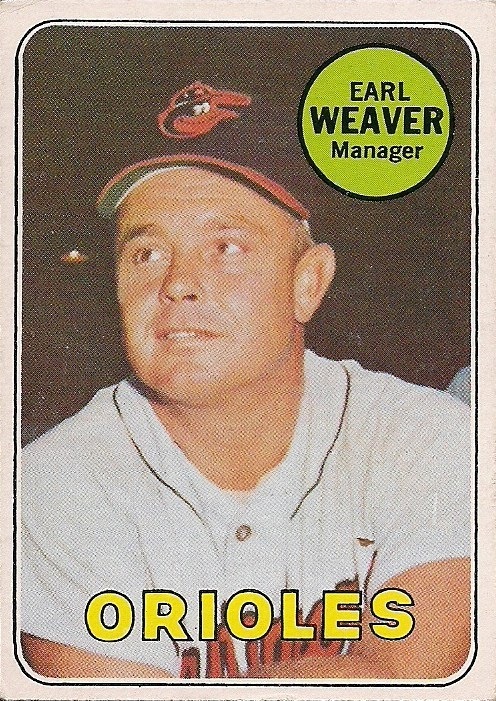 This is the famous Earl Weaver Sees a UFO Manager Rookie Card. 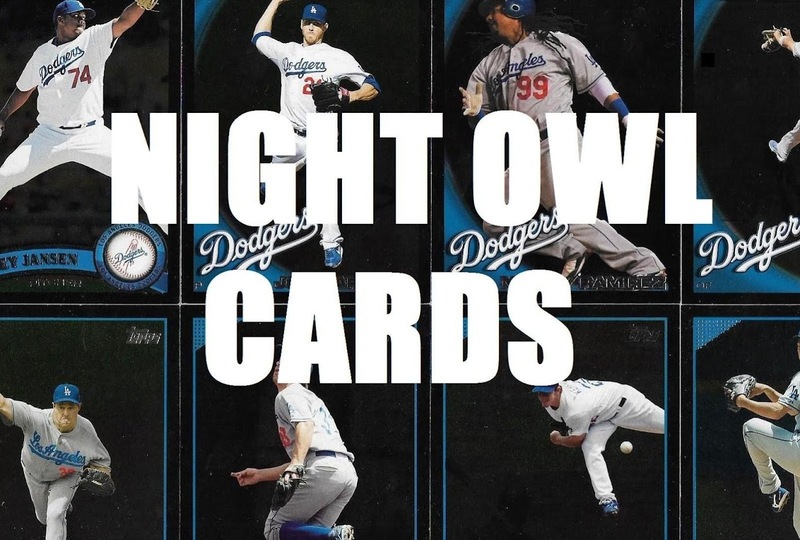 But I don't think it's actually a night card. I think it's an "in the dugout" card or maybe an "in the clubhouse" card. I can't even tell you if that item Weaver is staring at is a light. Maybe it IS a UFO. First there's future Dodgers pinch-bunting extraordinaire Vic Davalillo. 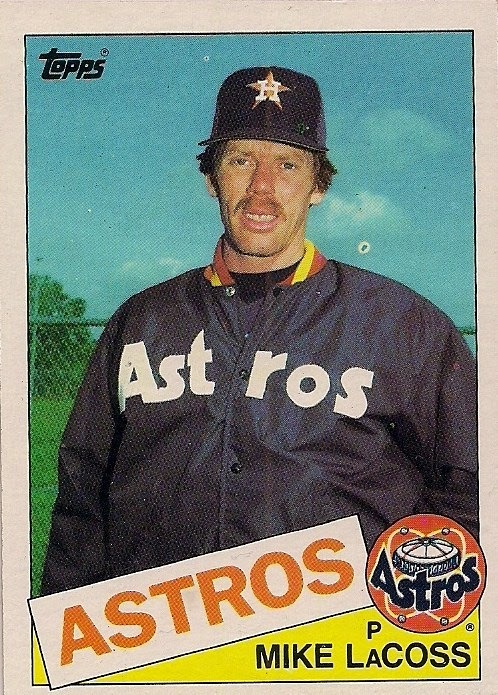 Then there's one of the greatest Hoyt Wilhelm cards of all-time. 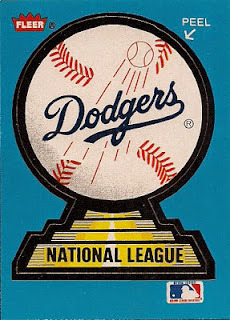 Then there's this miscut beauty, which happens to be on the Best Dodgers Cards Ever Made top 100. It's No. 20 on that list, but I really need to do another update of that list. Last one, but couldn't be finer. 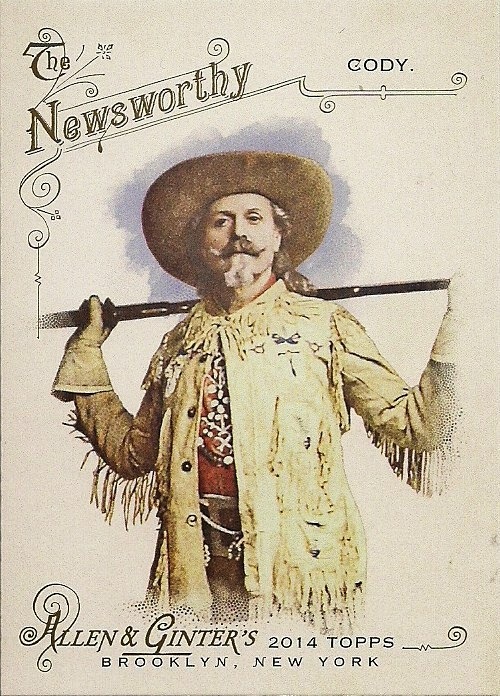 Love Bob Veale cards. Love Bob Veale cards in front of the biggest batting cage of the 1970s. 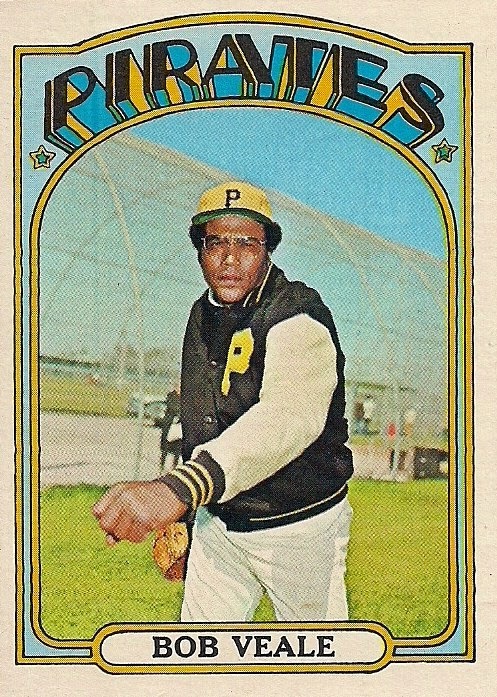 Love Bob Veale cards in front of the biggest batting cage of the 1970s while Veale is wearing the same jacket that my daughter bought recently minus the "P" on the front. Is there a better kind of vintage? 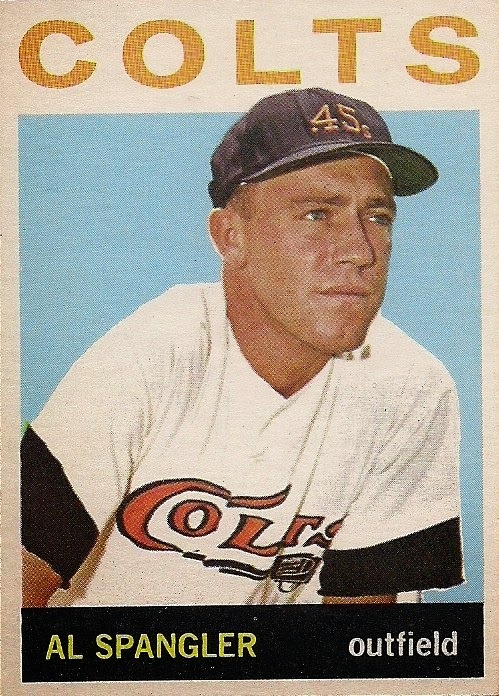 Every collector must have a Colt .45s card in which the uniform features a gun on the front of the jersey. Different times, man. You're looking at my first cards of all four of those individuals (I probably had an O.J. Simpson card back when I was a kid but all those football cards disappeared long ago). Sure there's some controversy there, but as a Bills fan, I should have a Simpson card. 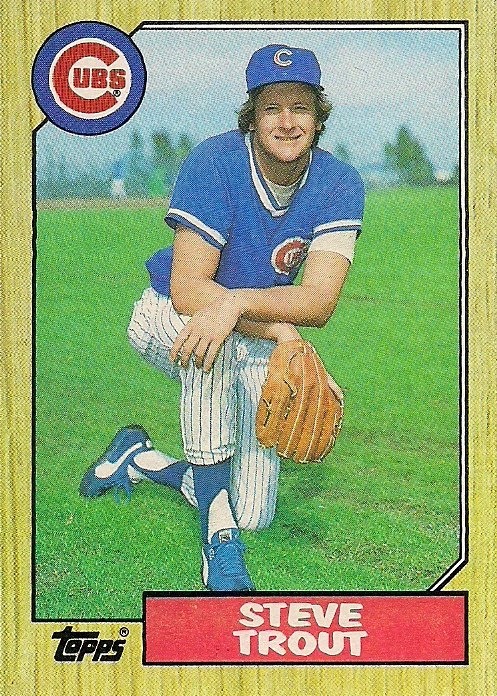 And as a writer, I should have a Jim Bouton card (actually, come to think of it, I do). And as a fan of 1970s beer commercials, I should have a Bob Uecker card. 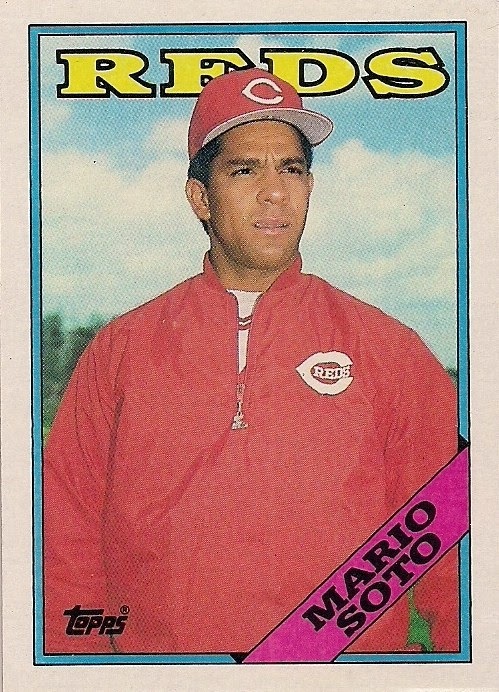 And, finally, if you put "Choo Choo" as someone's name on a baseball card, that should be in my collection, too. I feel more complete than I did before I got these cards. So that was some kind of haul! I'm so buried in cardboard greatness that I don't even remember who won the World Series. Today you're all focused on Game 7 of the World Series (or should be). I am, too, although part of me has turned to mush because that's what every Oct. 29th does to me. But I try to convert this mushy holiday in which I met my girlfriend for life into something about baseball cards every year. And since that special Oct. 29 came in 1987, I figured that's the best time to feature the sets of 1987 in the Best Set Of The Year series. 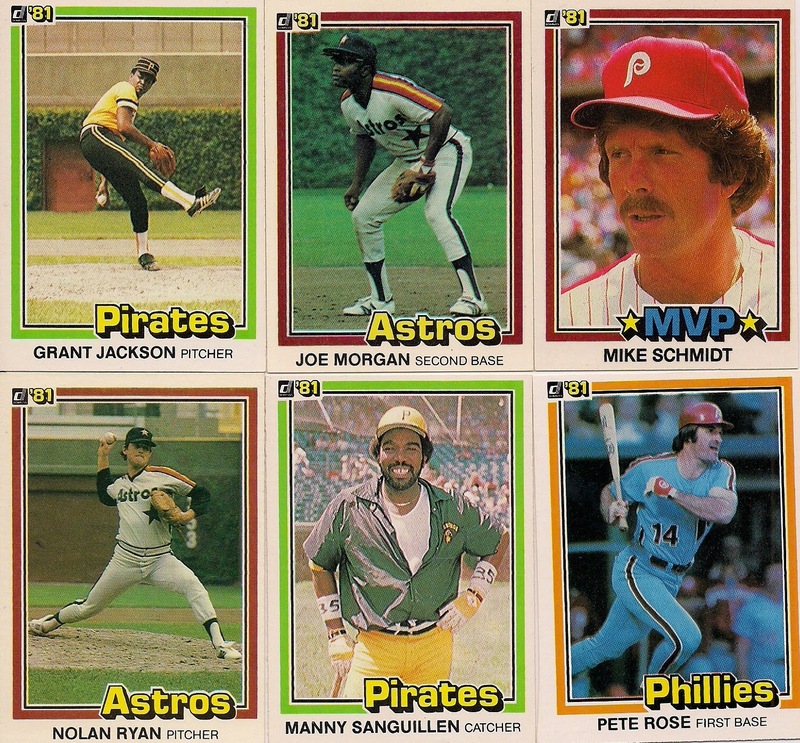 In this series I arbitrarily rank the sets issued each year from 1981 forward. Since we're at 1987 now, we've stepped squarely into the junk wax era. Topps, Donruss and Fleer were all very prominent in 1987. Sportflics also issued their second set (and the first one that I ever saw). But I don't consider Sportflics a major set, so I'm excluding them. I'm a little hesitant to rank these just because '87 sets seem much beloved by the 30-something crowd and I'm entirely too dismissive of sets from the late '80s. In 1987, I was very much into the college and bar scene and cards were barely a thought. I collected a few rack packs of Topps, that's it. But then that's what this blog is for, opinionating, right? Plusses: A distinctive and memorable design. Wood borders, although a blatant self-tribute by Topps, make for an unforgettable look. 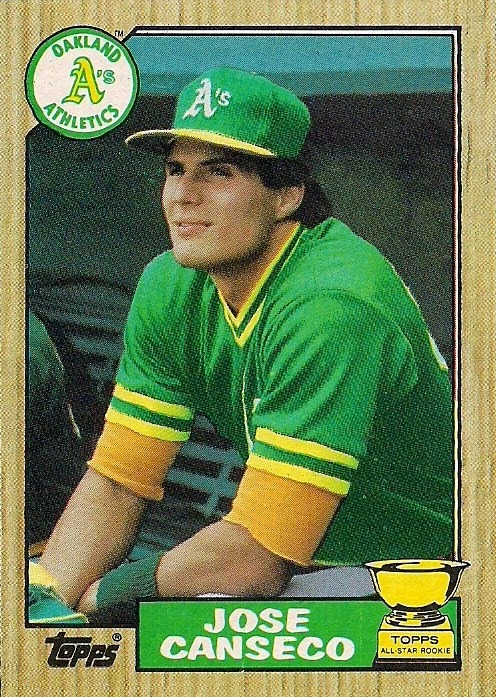 ... the photographs are much improved over 1986 Topps in terms of quality ... team logos are always fun ... the colored name rectangle really stands out for certain teams (the Oakland A's, especially). 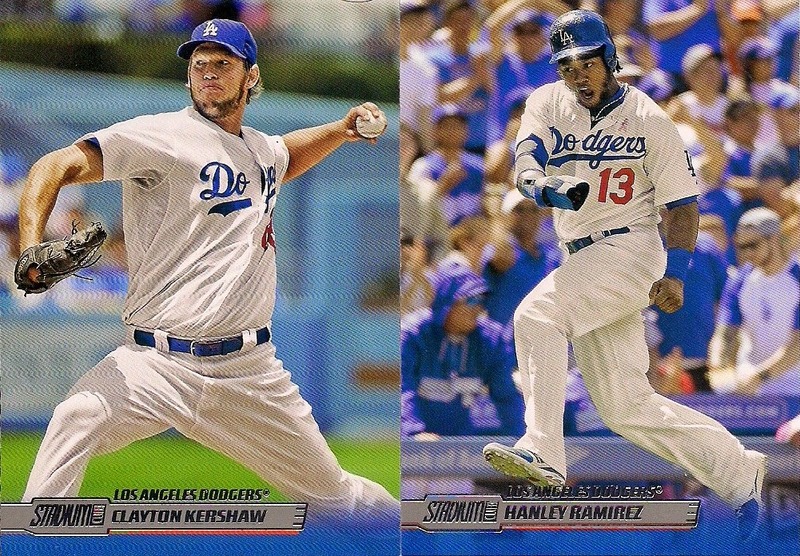 You already did this design, Topps. 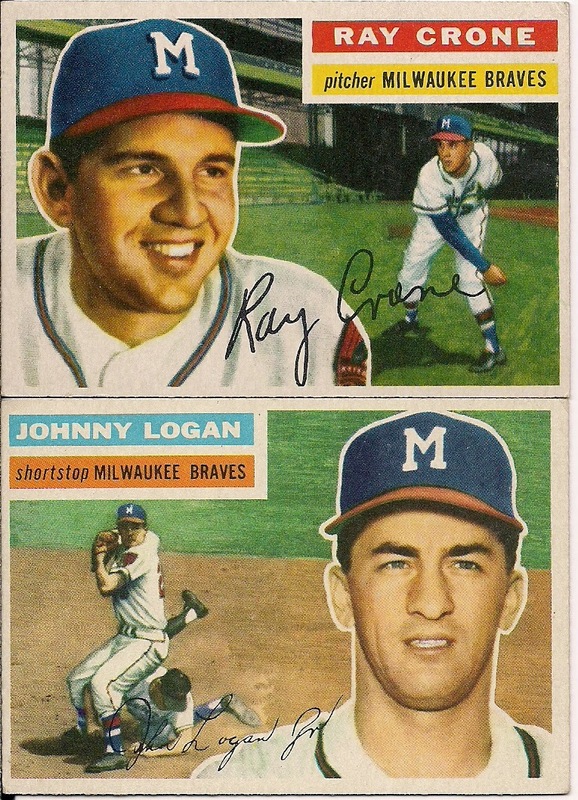 For those who argue that Topps was getting stale right around this time period, this is an excellent example. Plusses: Hey, look! Topps put the vital information on the bottom! This was very unlike Topps, although it was probably just copying Fleer, which did that in 1982. ... 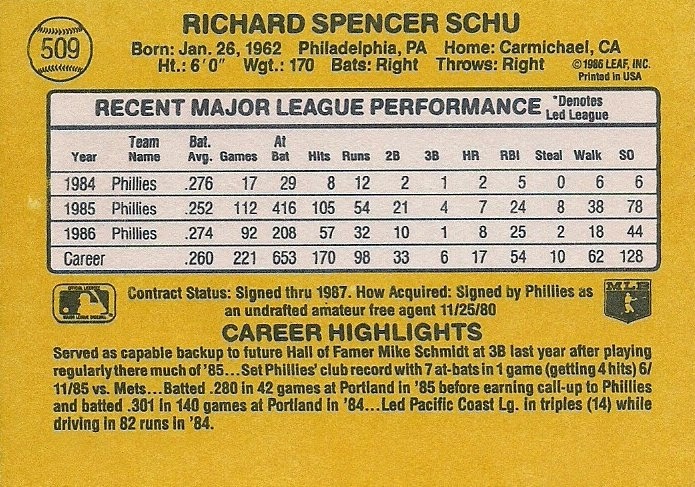 The back is more readable than the Topps card backs that immediately preceded it. ... For cards where there's room (limited year-by-year stats), Topps includes "On This Date" facts, which are sort of interesting. 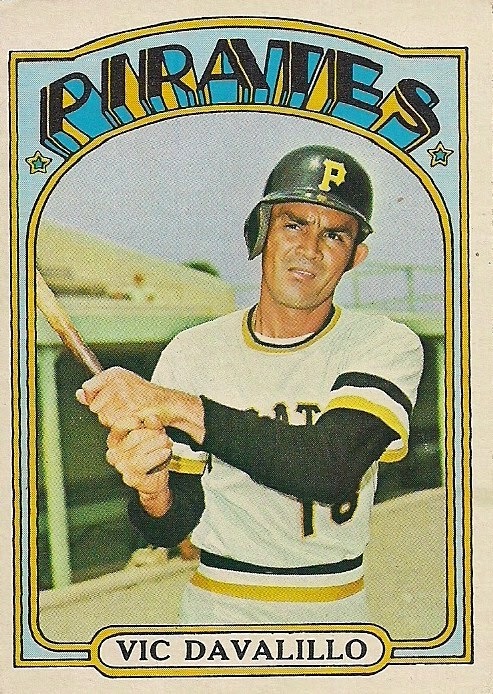 Minuses: You will never get me to like yellow on cards, unless it's a 1972 Topps Astros card. ... Still more '80s card back dullness. In many cases the card back is just complete stats. 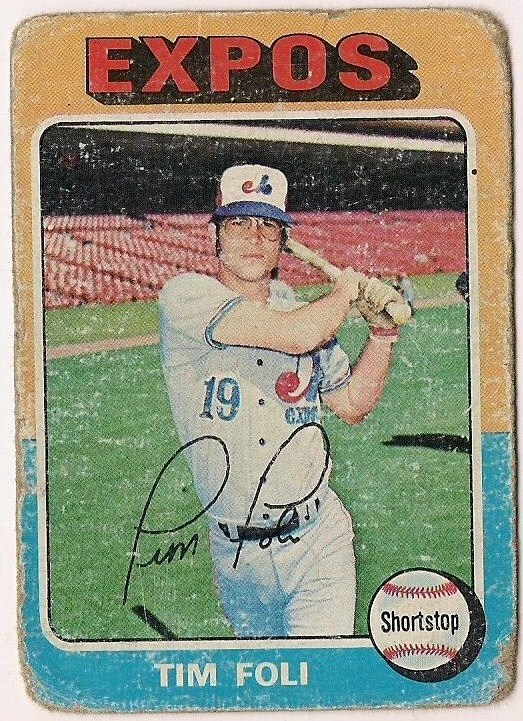 Plusses: For whatever reason, it seems to be the set that got a lot of collectors into the hobby. Maybe because it was everywhere. ... The rookie cup returned! Yay! 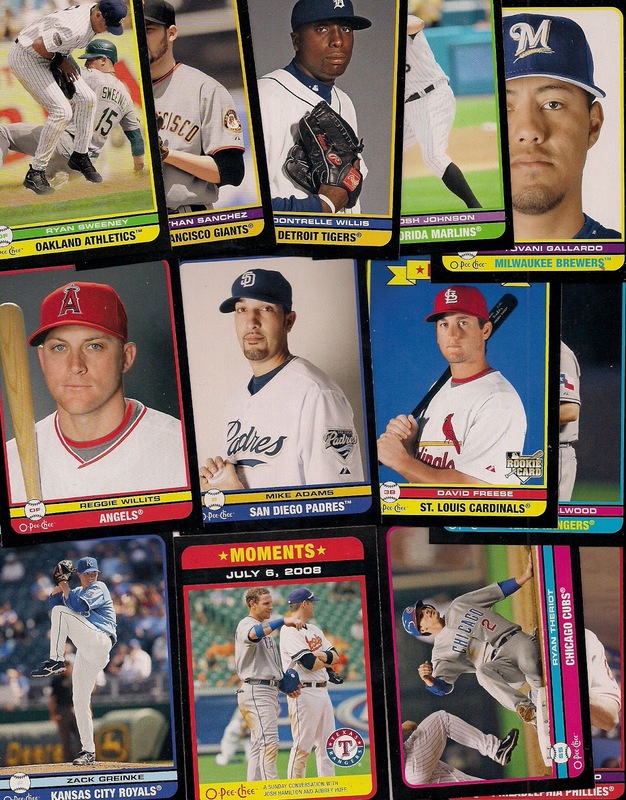 For the first time since 1978, Topps featured a rookie cup on cards depicting members of its all-rookie team. This is something that should have never left. ... Some memorable cards, like the Kevin Mitchell dust-up shot. ... Got to like the Topps cardboard. I'll mention this every time (at least until the 1990s). 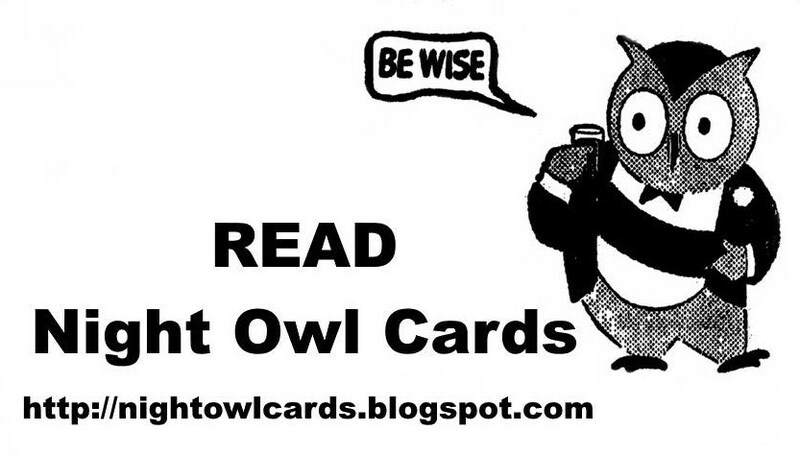 ... Another big set of 792 cards. ... Some pretty good rookies during a time when the rookie was king. Barry Larkin, Rafael Palmeiro. 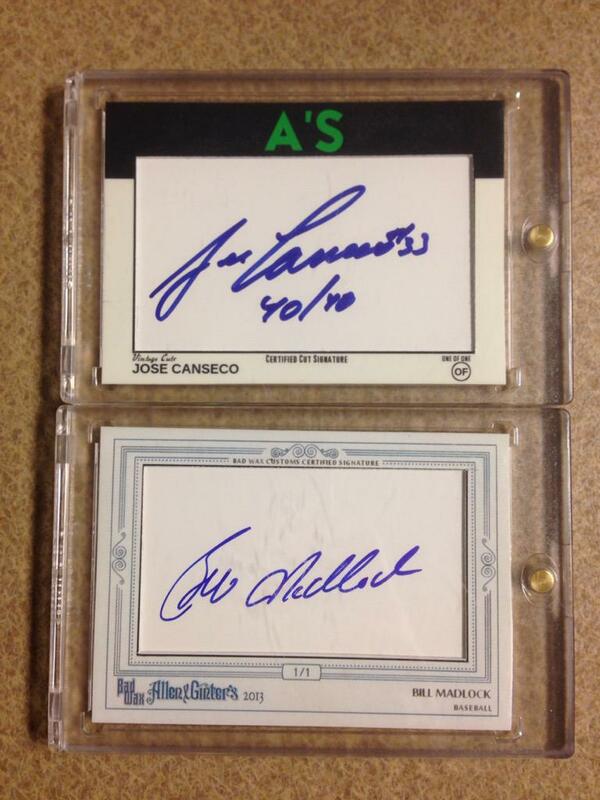 Coveted cards of Barry Bonds and Jose Canseco, too. Plus the Bo Jackson Future Star. 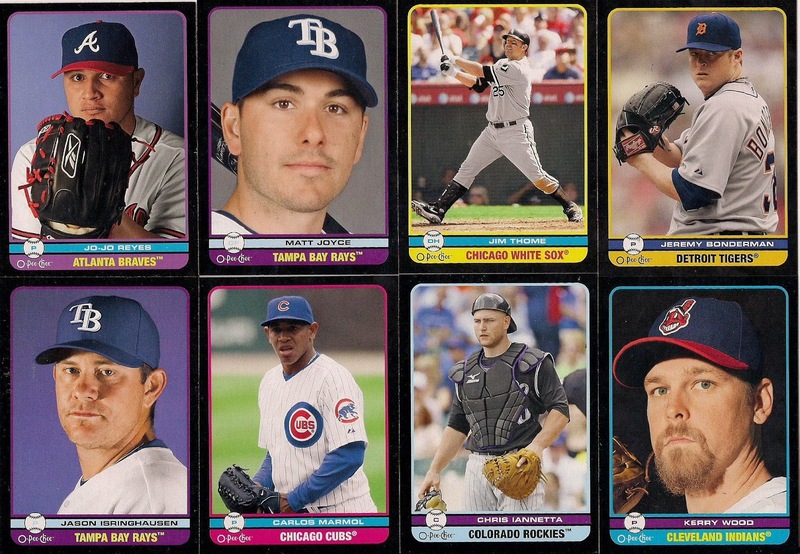 Minuses: I have completed every Topps flagship set of the 1980s except 1987. It just doesn't hold my interest. ... 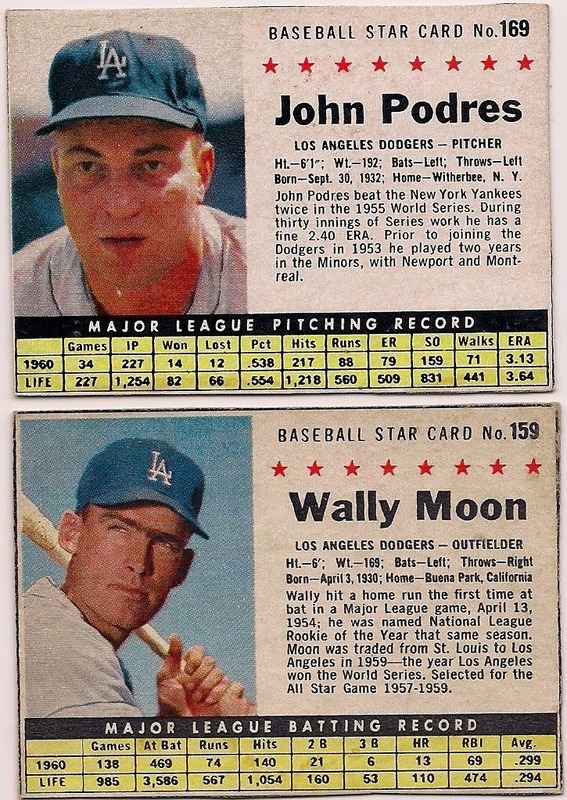 I think '89 Topps has it beat, but it'd be a pretty good race between the two in terms of which set is more abundant and therefore more worthless, monetarily speaking. 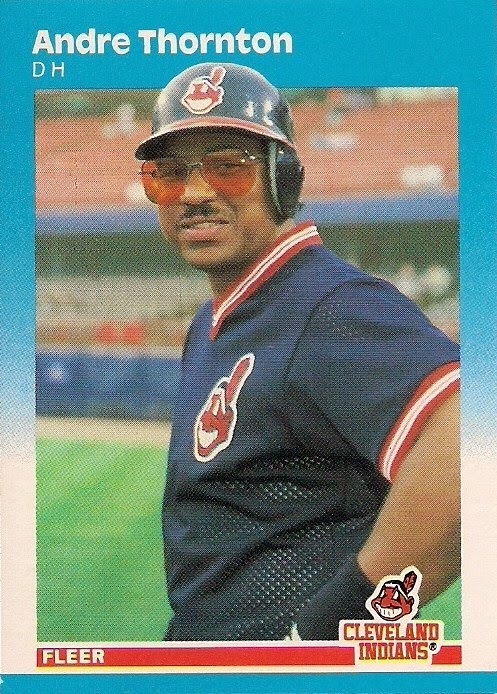 Plusses: One of my favorite Fleer looks from the '80s. Love blue. Love the gradient design. ... 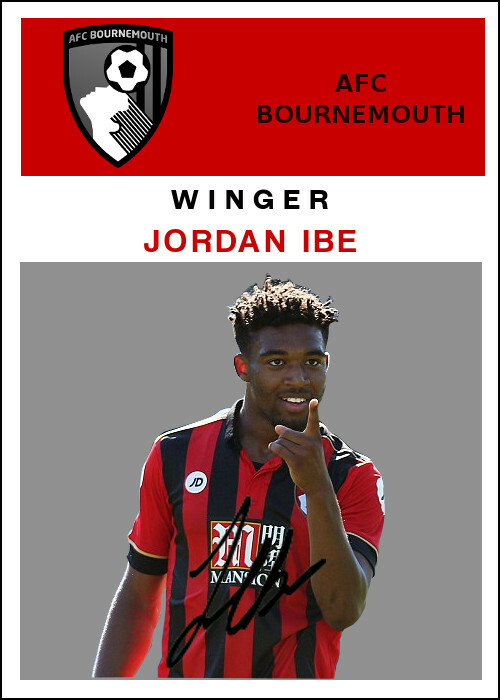 The color bar works very well with some teams in terms of tying the photo with the design. ... It features a cool, sleek look that appeals to me. ... The logo is nice and not big and jarring. Minuses: The amount of border on the card sometimes crowds the photo. It's more apparent on some cards than others. 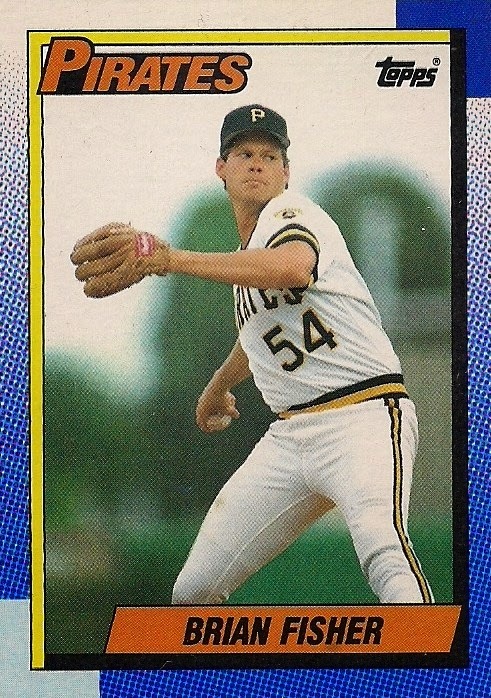 ... A lot of closeups of players not doing anything, which was rather standard for Fleer. Plusses: Fleer is still numbering its set by team with the previous year's World Series champions at the start. So much easier for organizational purposes. ... 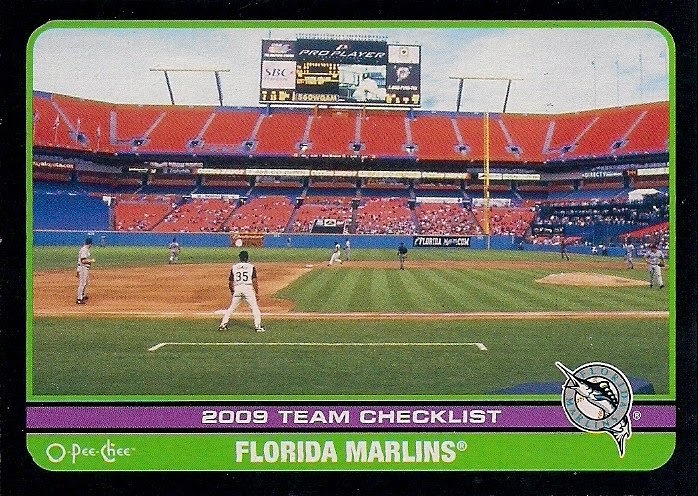 The back is more colorful than past Fleer backs (i.e. more than one color). ... The "How's He Hitting 'Em" is a nice graphic that was advanced for its time. The pitchers cards featured "He's Got The Stuff", which rated a pitcher's repetoire. 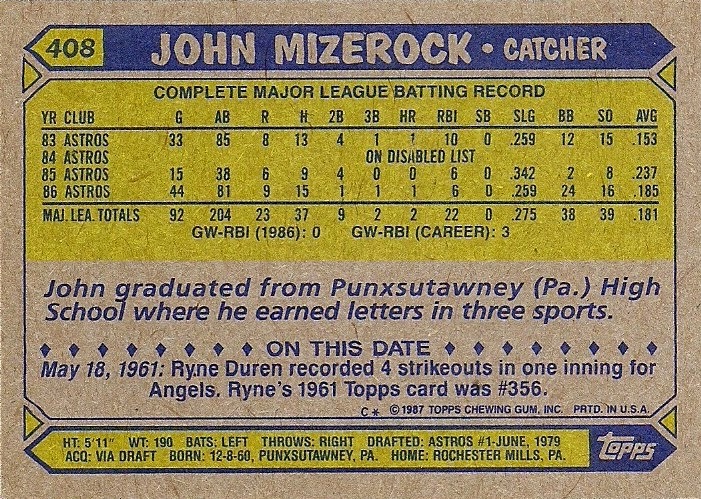 Minuses: The famous Fleer "wasted space" for players with few years in pro baseball. ... The graphic is very small and hard on the eyes (especially for non-kids). 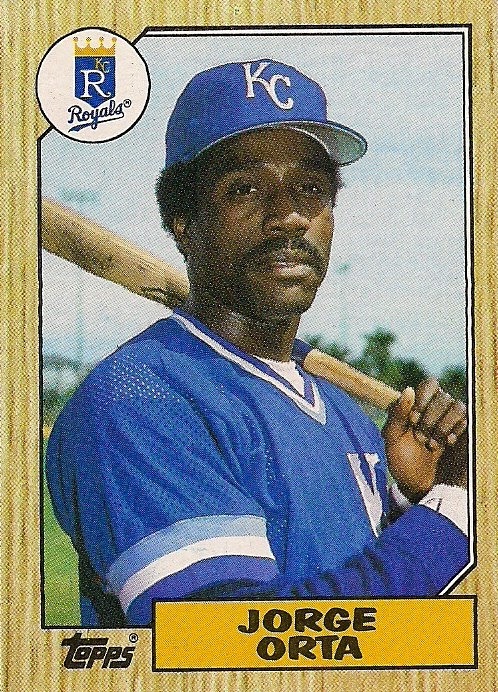 ... Fleer stayed with vertical backs throughout the '80s, which I never liked. Plusses: I love "blue sets" ... The cards give off a "premium" glossy vibe even though they aren't. ... The team logo still rules and everyone knows it. For the second time this decade, all three sets featured the team logo on the front. That's Fleer's doing. ... Rookie cards of Barry Larkin and Jamie Moyer. Minuses: I'm not one of those that loathes it when the design overpowers the photo, but I think this is one of the sets in which this happens. Plusses: Black borders for the second time in three years. Black borders rule. ... The "path of baseballs" about a third of the way down the card are fun for some people. Emphasis on "some people". Minuses: These black borders are no more immune to chipping than any others. ... This is one of my least favorite black border sets of all-time. In fact, I think this is the set that made me realize that not all black-bordered sets were cool (later confirmed repeatedly by Bowman). ... I actually hate the path of baseballs. 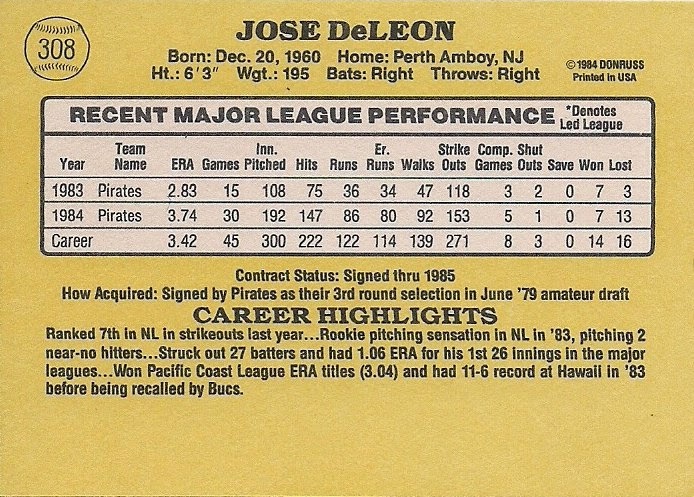 Like many things that Donruss did in the '80s, it looks childish and drawn by a 9-year-old and we probably could have a much cooler card without them (I know you disagree, I don't care). Plusses: Once again, give credit to Donruss for full names and contract status. Minuses: The same back every freakin' year. Anytime I see a Donruss back from the '80s, Bob Seger's "Still the Same" plays in my head and BOB SEGER SHOULD NEVER PLAY IN MY HEAD. ... The return of yellow. Ugh. But if we're being accurate, it's actually gold. Plusses: You've got to give Donruss credit for trying again with the black border. ... 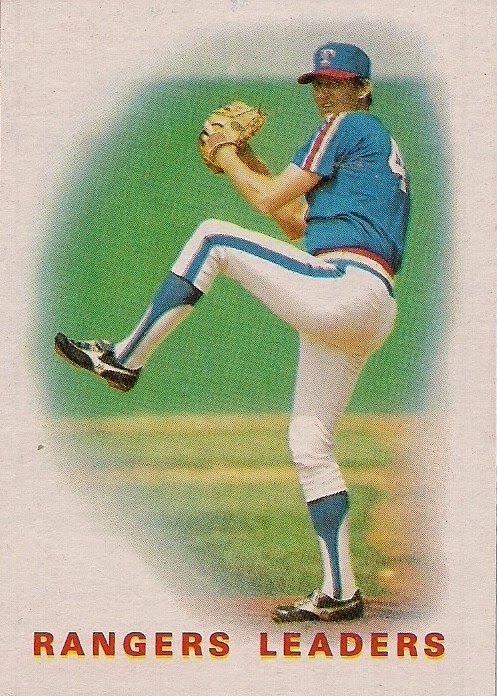 Features one of the more memorable rookie cards of the 1980s in mustachioed Greg Maddux. ... 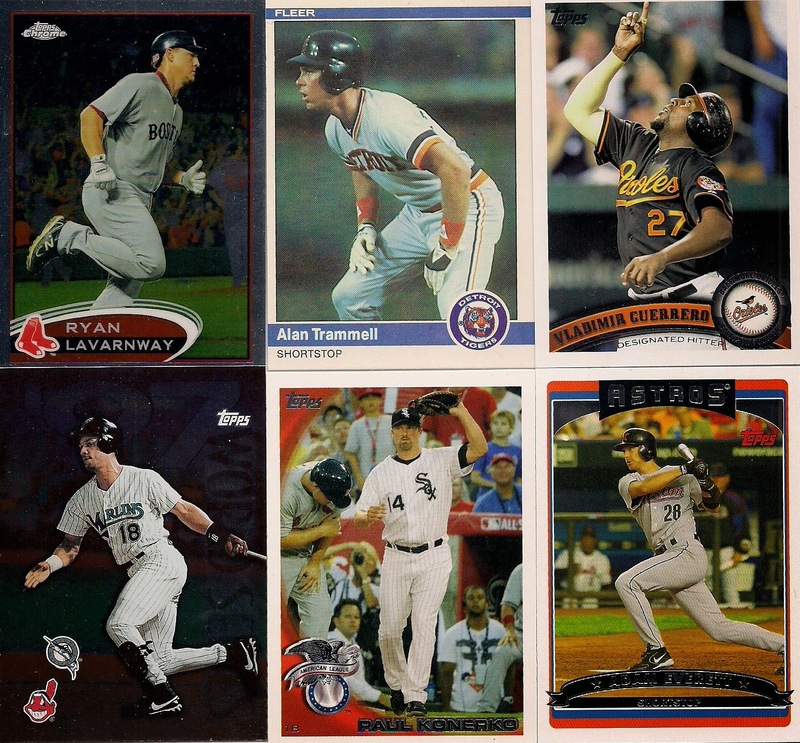 Rated Rookies continue to have staying power, especially with the likes of Mark McGwire and Bo Jackson in the set. 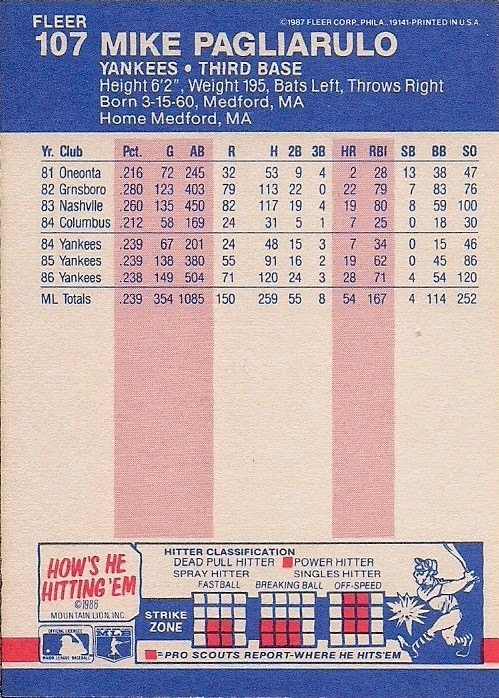 Minuses: It seems that I have an issue with sets with rounded borders (1987 Donruss, 1983 Donruss). ... 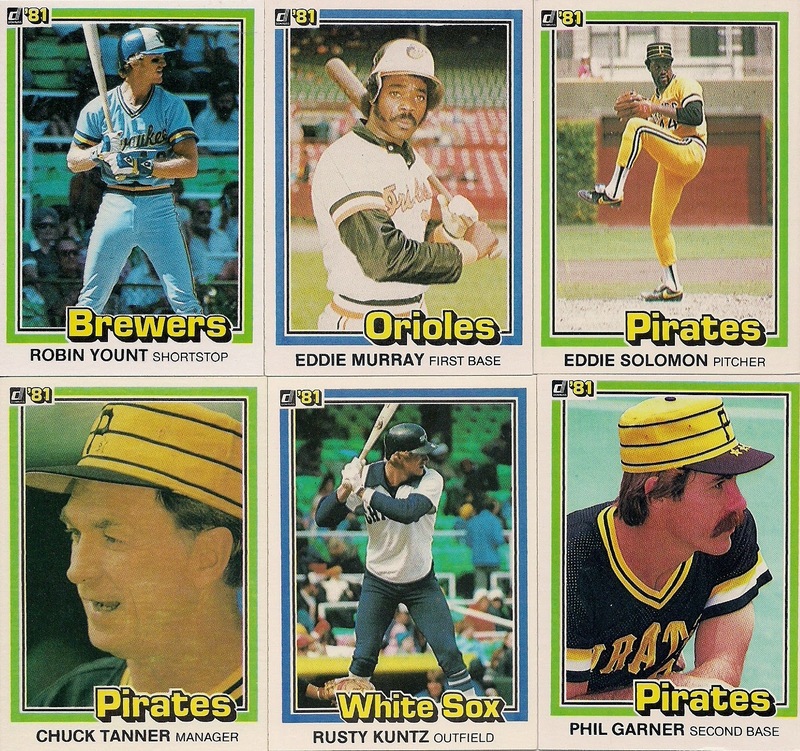 Overall, it's not a bad set (if you avoid the back), but like many Donruss sets of the '80s, it doesn't float my boat. And now it's time to reveal the overall winner. Believe me, I swayed between Topps and Fleer right until the end. If I get more '87 Fleer cards, maybe I'll change my answer. Who will hand me my crown?